Big brother to the award-winning Odyssey Super Camper. Ideal for 2-4 people, wanting extra internal space. The 13’6”” Eclipse is extremely versatile and shares the Quantum Super Camper chassis, suspension and body. The newly designed rear shower pod features hot/cold water with a bug proof, zipped removable mesh floor for easy cleaning. The lightweight easy to use aluminium pod cover is lockable and totally dust proof. The exterior awning space is maximised with the new optional state of the art L-shaped stainless-steel slide out kitchen and BBQ area with large preparation areas and versatile pantry. The newly designed nose cone features large through boot, suitable for storage of slide out fridge/freezer and generator and has top access storage. The under-bed storage is cavernous with enough room for the whole family’s belongings. The unique lift up bed design, when positioned in the “Day Mode”, gives enormous inside space in the four-person lounge/dinette. The interior is luxurious with stylish European décor, enjoy endless sunrises and sunsets from the large opening and lockable windows. The bed head features a handy shelf for personal items. The Eclipse features a large L-shaped internal kitchen with 130 litre fridge/freezer, 3 burner gas stove and hot/cold sink with large preparation areas. The options list is extensive and includes up to 3 separate water tanks for extended outback trips. 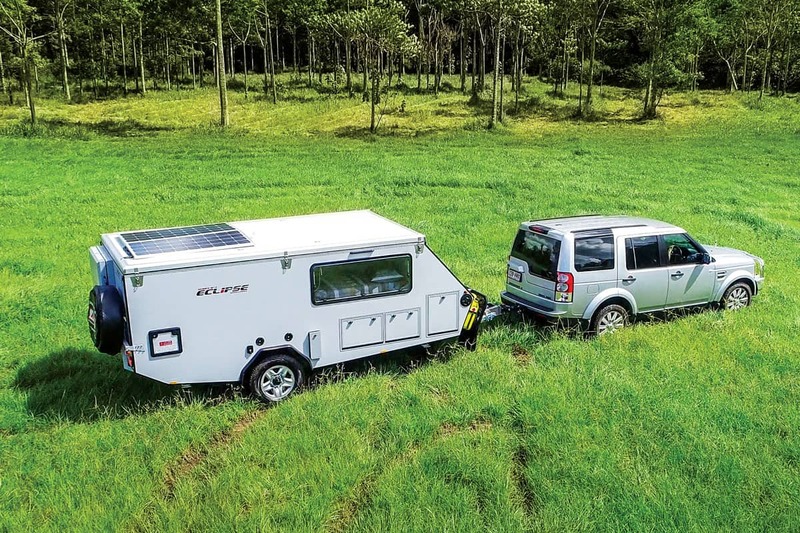 The Eclipse SIV has been built to be taken off the grid in extreme comfort and style. The photos in this gallery display standard and option features of the Eclipse.